Jacob August Riis (/riːs/; May 3, 1849 – May 26, 1914) was a Danish-American social reformer, "muckraking" journalist a social documentary photographer. He is known for using his photographic and journalistic talents to help the impoverished in New York City; those impoverished New Yorkers were the subject of most of his prolific writings and photography. He endorsed the implementation of "model tenements" in New York with the help of humanitarian Lawrence Veiller. Additionally, as one of the most famous proponents of the newly practicable casual photography, he is considered one of the fathers of photography due to his very early adoption of flash in photography. 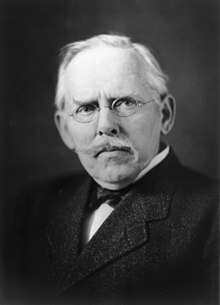 Born in Ribe, Denmark, Jacob Riis was the third of the 15 children (one of whom, an orphaned niece, was fostered) of Niels Edward Riis, a schoolteacher and writer for the local Ribe newspaper, and Carolina Riis (née Bendsine Lundholm), a homemaker. Among the 15, only Jacob, one sister, and the foster sister survived into the twentieth century. Riis was influenced by his father, whose school Riis delighted in disrupting. His father persuaded him to read (and improve his English via) Charles Dickens's magazine All the Year Round and the novels of James Fenimore Cooper. Jacob had a happy childhood, but the experienced tragedy at the age of eleven when his brother Theodore, a year younger, drowned. He never forgot his mother's grief. At age eleven or twelve, he donated all the money he had and gave it to a poor Ribe family living in a squalid house if they cleaned it. The tenants took the money and obliged; when he told his mother, she went to help. Though his father had hoped that Jacob would have a literary career, Jacob wanted to be a carpenter. When he was 16, he became fond of Elisabeth Gjørtz, the 12-year-old adopted daughter of the owner of the company for which he worked as an apprentice carpenter. The father disapproved of the boy's blundering attentions, and Riis was forced to complete his carpentry apprenticeship in Copenhagen. Riis returned to Ribe in 1868 at age 19. Discouraged by poor job availability in the region and Gjørtz's disfavor of his marriage proposal, Riis decided to emigrate to the United States. Riis immigrated to America in 1870, when he was 21 years old, seeking employment as a carpenter. He first traveled in a small boat from Copenhagen to Glasgow, where on May 18 he boarded the steamer Iowa, traveling in steerage. He carried $40 donated by friends (he had paid $50 for the passage himself); a gold locket with a strand of Elisabeth's hair, presented by her mother; and letters of introduction to the Danish Consul, Mr. Goodall (later president of the American Bank Note Company), a friend of the family since his rescue from a shipwreck at Ribe. Riis disembarked in New York on June 5, on that day spending half of the $40 his friends had given him on a revolver for defense against human or animal predators. After five days, during which he used almost all his money, Riis found work as a carpenter at Brady's Bend Iron Works on the Allegheny River above Pittsburgh. After a few days of that, he began mining for increased pay but quickly resumed carpentry. Learning on July 19, 1870, that France had declared war on Germany, he expected that Denmark would join France to avenge the Prussian seizure of Schleswig, and determined to fight for France. He returned to New York, and, having pawned most of his possessions and without money, attempted to enlist at the French consulate, but was told that there was no plan to send a volunteer army from America. Pawning his revolver, he walked out of New York until he collapsed from exhaustion; on waking, he walked to Fordham College where a Catholic priest served him breakfast. After a brief period of farm working and odd jobs at Mount Vernon, New York, Riis returned to New York, where he read in the newspaper New York Sun that the newspaper was recruiting soldiers for the war. Riis rushed there to enlist, but the editor (whom he later realized was Charles Anderson Dana) claimed or affected ignorance but offered the famished Riis a dollar for breakfast; Riis indignantly refused. Riis was destitute, at one time sleeping on a tombstone and surviving on windfall apples. Still, he found work at a brickyard at Little Washington in New Jersey, and was there for six weeks until he heard that a group of volunteers was going to the war. Thereupon he left for New York. On arrival, Riis found that the rumor was true but that he had arrived too late. He pleaded with the French consul, who expelled him. He made various other attempts to enlist, none successful. As autumn began, Riis was destitute, without a job. He survived on scavenged food and handouts from Delmonico's Restaurant and slept in public areas or in a foul-smelling police lodging-house. At one time Riis's only companion was a stray dog. One morning he awoke in a lodging-house to find that his gold locket (with its strand of Elisabeth's hair) had been stolen. He complained to the sergeant, who became enraged and expelled him. Riis was devastated. The story became a favorite of Riis's. One of his personal victories, he later confessed, was not using his eventual fame to ruin the career of the offending officer. Disgusted, he left New York, buying a passage on a ferry with the silk handkerchief that was his last possession. By doing odd jobs and stowing away on freight trains, Riis eventually reached Philadelphia, where he appealed to the Danish Consul, Ferdinand Myhlertz, for help and was cared for two weeks by the Consul and his wife. Myhlertz sent Riis, now dressed properly in a suit, to the home of an old classmate in Jamestown. Riis worked as a carpenter in Scandinavian communities in the western part of the state, also working a variety of other jobs. He achieved sufficient financial stability to find the time to experiment as a writer, in both Danish and English, although his attempt to get a job at a Buffalo, New York newspaper was unsuccessful, and magazines rejected his submissions. Riis was in much demand as a carpenter, a major reason being the low prices he charged. However, his employers exploited his efficiency and low prices, and Riis returned to New York City. He was most successful as a salesman, particularly of flatirons and fluting irons, becoming promoted to the sales representative of them for Illinois. However, in Chicago he was cheated of both his money and his stock and had to return to an earlier base in Pittsburgh. There he found that his subordinates he had left to sell in Pennsylvania had cheated him in the same manner. He again had little money, and while bedridden with a fever learned from a letter that Elisabeth, the former object of his affection, was engaged to a cavalry officer. Riis then returned to New York by selling flatirons along the way. Riis noticed an advertisement by a Long Island newspaper for an editor, applied for and was appointed city editor. He quickly realized why the job had been available: the editor in chief was dishonest and indebted. Riis left in two weeks. Again unemployed, Riis returned to the Five Points neighborhood. He was sitting outside the Cooper Union one day when the principal of the school where he had earlier learned telegraphy happened to notice him. He said that if Riis had nothing better to do, then the New York News Association was looking for a trainee. After one more night and a hurried wash in a horse trough, Riis went for an interview. Despite his disheveled appearance, he was sent for a test assignment: to observe and write about a luncheon at the Astor House. Riis covered the event competently and got the job. Riis was able to write about both the rich and live in impoverished immigrant communities. He did his job well and was able to become editor of a weekly newspaper, the News. However, this newspaper, the periodical of a political group, soon became bankrupt. Simultaneously, and unusually, Riis got a letter from home which related that both his older brothers, an aunt, and Elisabeth Gjørtz's fiancé had died. Riis wrote to Elisabeth to propose, and with $75 of his savings and promissory notes, he bought the News company. Riis worked hard at his newspaper and soon paid his debts. Newly independent, he was able to target the politicians who had previously been his employers. Meanwhile, he received a provisional acceptance from Elisabeth, who asked him to come to Denmark for her, saying "We will strive together for all that is noble and good". Conveniently, the politicians offered to buy back the newspaper for five times the price Riis had paid; he was thus able to arrive in Denmark with a substantial amount of money. After some months in Denmark, the newly married couple arrived in New York. Riis worked briefly as editor of a south Brooklyn newspaper, the Brooklyn News. To supplement his income, he used a "magic lantern" projector to advertise in Brooklyn, projecting either onto a sheet hung between two trees or onto a screen behind a window. The novelty was a success, and Riis and a friend relocated to upstate New York and Pennsylvania as itinerant advertisers. However, this enterprise ended when the pair became involved in an armed dispute between striking railroad workers and the police. Riis quickly returned to New York City. A neighbor of Riis, who was the city editor of the New-York Tribune, recommended Riis for a short-term contract. Riis did well and was offered the job of police reporter. He was based in a press office across from police headquarters on Mulberry Street. "Nicknamed 'Death's Thoroughfare'", Riis's biographer Alexander Alland writes, "It was here, where the street crooks its elbow at the Five Points, that the streets and numerous alleys radiated in all directions, forming the foul core of the New York slums." During these stints as a police reporter, Riis worked the most crime-ridden and impoverished slums of the city. Through his own experiences in the poorhouses, and witnessing the conditions of the poor in the city slums, he decided to make a difference for them. Working night-shift duty in the immigrant communities of Manhattan's Lower East Side, Riis developed a tersely melodramatic writing style and he became one of the earliest reformist journalists. Bandit's Roost (1888) by Jacob Riis, from How the Other Half Lives. This image is Bandit's Roost at 59½ Mulberry Street, considered the most crime-ridden, dangerous part of New York City. Riis had for some time been wondering how to show the squalor of which he wrote more vividly than his words could express. He tried sketching, but was incompetent at this. Camera lenses of the 1880s were slow as was the emulsion of photographic plates; photography thus did not seem to be of any use for reporting about conditions of life in dark interiors. In early 1887, however, Riis was startled to read that "a way had been discovered to take pictures by flashlight. The darkest corner might be photographed that way." The German innovation, by Adolf Miethe and Johannes Gaedicke, flash powder was a mixture of magnesium with potassium chlorate and some antimony sulfide for added stability; the powder was used in a pistol-like device that fired cartridges. This was the introduction of flash photography. Recognizing the potential of the flash, Riis informed a friend, Dr. John Nagle, chief of the Bureau of Vital Statistics in the City Health Department who was also a keen amateur photographer. Nagle found two more photographer friends, Henry Piffard and Richard Hoe Lawrence, and the four of them began to photograph the slums. Their first report was published in the New York newspaper The Sun on February 12, 1888; it was an unsigned article by Riis which described its author as "an energetic gentleman, who combines in his person, though not in practice, the two dignities of deacon in a Long Island church and a police reporter in New York". The "pictures of Gotham's crime and misery by night and day" are described as "a foundation for a lecture called 'The Other Half: How It Lives and Dies in New York.' to give at church and Sunday school exhibitions, and the like." The article was illustrated by twelve line drawings based on the photographs. Riis and his photographers were among the first Americans to use flash photography. Pistol lamps were dangerous and looked threatening, and would soon be replaced by another method for which Riis lit magnesium powder on a frying pan. The process involved removing the lens cap, igniting the flash powder and replacing the lens cap; the time is taken to ignite the flash powder sometimes allowed a visible image blurring created by the flash. Riis's first team soon tired of the late hours, and Riis had to find other help. Both his assistants were lazy and one was dishonest, selling plates for which Riis had paid. Riis sued him in court successfully. Nagle suggested that Riis should become self-sufficient, so in January 1888 Riis paid $25 for a 4×5 box camera, plate holders, a tripod and equipment for developing and printing. He took the equipment to the potter's field cemetery on Hart Island to practice, making two exposures. The result was seriously overexposed but successful. 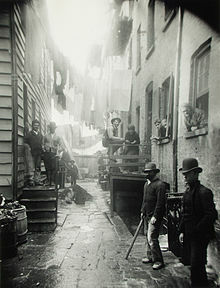 Because so much of the work was done at night, he was able to photograph the worst elements of the New York slums, the dark streets, tenement apartments, and "stale-beer" dives, and documented the hardships faced by the poor and criminal, especially in the vicinity of notorious Mulberry Street. Riis accumulated a supply of photography and attempted to submit illustrated essays to magazines. But when an editor at Harper's New Monthly Magazine said that he liked the photographs but not the writing, and would find another writer, Riis was despondent about magazine publication and instead thought of speaking directly to the public. This was not easy. The obvious venue would be a church, but several churches—including Riis's own—demurred, fearing either that the talks would offend the churchgoers' sensibilities or that they would offend rich and powerful landlords. However, Adolph Schauffler (of the City Mission Society) and Josiah Strong arranged to sponsor Riis's lecture at the Broadway Tabernacle church. Lacking money, Riis partnered with W. L. Craig, a Health Department clerk. Riis and Craig's lectures, illustrated with lantern slides, made little money for the pair, but they both greatly increased the number of people exposed to what Riis had to say and also enabled him to meet people who had the power to affect change, notably Charles Henry Parkhurst and an editor of Scribner's Magazine, who invited him to submit an illustrated article. An eighteen-page article by Riis, How the Other Half Lives, appeared in the Christmas 1889 edition of Scribner's Magazine. It included nineteen of his photographs rendered as line drawings. Its publication brought an invitation to expand the material into an entire book. Riis, who favored Henry George's 'single tax' system and absorbed George's theories and analysis, used that opportunity to attack landlords "with Georgian fervor". How the Other Half Lives sold well and was much quoted. Reviews were generally good, although some reviewers criticized it for oversimplifying and exaggerating. Riis attributed the success to a popular interest in social amelioration stimulated by William Booth's In Darkest England and the Way Out, and also to Ward McAllister's Society as I Have Found It, a portrait of the moneyed class. The book encouraged imitations such as Darkness and Daylight; or, Lights and Shadows of New York Life (1892), which somehow appropriated Riis's own photographs. Children of the Poor (1892) was a sequel in which Riis wrote of particular children that he had encountered. The Making of an American (1901), an autobiography, follows Riis's early life in Denmark and his struggles as an immigrant in the United States. The book also describes how Riis became a reporter and how his work in immigrant enclaves kindled his desire for social reforms. Riis organized his autobiography chronologically, but each chapter illustrates a broader theme that America is a land of opportunity for those who are bold enough to take chances on their future. The autobiography is mostly straightforward, but Riis is not sure if his past should be told as a "love story", "if I am, to tell the truth ... I don't see how it can be helped." Although much of it is biographical, Riis also lays out his opinions about how immigrants like himself can succeed in the United States. Chapter 7 is distinct because Riis's wife, Elizabeth, describes her life in Denmark before she married Riis. Whereas How the Other Half Lives, and some of Riis's other books received praise from critics, he received a mixed reception for his autobiography. A New York Times reviewer dismissed it as a vanity project written for "close and intimate friends". He admired Riis's "dogged pluck" and "indomitable optimism", but dismissed an "almost colossal egotism-made up of equal parts of vanity and conceit" as a major characteristic of the author. The reviewer anticipated the book would be "eagerly read by that large majority who have a craving and perennial interest in the personal and emotional incidents" within Riis's life. Riis anticipated such a critique, "I have never been able to satisfactorily explain the great run 'How The Other Half Lives' had ... like Topsy, it grew." Other newspapers, such as the New York Tribune, published kinder reviews. Two years later, another reviewer reported that Riis's story was widely reprinted and dubbed him as one of the "best-known authors and ... one of the most popular lecturers in the United States." The value of Riis's autobiography lies in the description of his origins as a social reformer. His early experiences in Ribe gave Riis a yardstick with which to measure tenement dwellers' quality of life. The account of the development of his powers of observation through his experiences as a poor immigrant lent authenticity to his news articles and larger works. Its themes of self-sufficiency, perseverance, and material success are prime examples of an archetype that successful Europeans like Riis used to demonstrate the exceptional opportunities that seem to exist only in the United States. In spite of its triumphalist outlook, The Making of an American remains useful as a source for students of immigration history and sociology who want to learn more about the author of How The Other Half Lives and the social reform movement that he helped to define. Theodore Roosevelt introduced himself to Riis, offering to help his efforts somehow. Upon his 1895 appointment to the presidency of the Board of Commissioners of the New York City Police Department, Roosevelt asked Riis to show him nighttime police work. During their first tour, the pair found that nine out of ten patrolmen were missing. Riis wrote about this for the next day's newspaper, and for the rest of Roosevelt's term the force was more attentive. 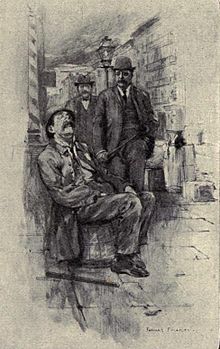 Recently a man, well qualified to pass judgment, alluded to Mr. Jacob A. Riis as "the most useful citizen of New York". Those fellow citizens of Mr. Riis who best know his work will be most apt to agree with this statement. The countless evils which lurk in the dark corners of our civic institutions, which stalk abroad in the slums, and have their permanent abode in the crowded tenement houses, have met in Mr. Riis the most formidable opponent ever encountered by them in New York City. For his part, Riis wrote a campaign biography of Roosevelt that praised him. The story resulted in the purchase by New York City of areas around the New Croton Reservoir, and may well have saved New Yorkers from an epidemic of cholera. Riis tried hard to have the slums around Five Points demolished and replaced with a park. His writings resulted in the Drexel Committee investigation of unsafe tenements; this resulted in the Small Park Act of 1887. Riis was not invited to the eventual opening of the park on 15 June 1897, but went all the same, together with Lincoln Steffens. In the last speech, the street cleaning commissioner credited Riis for the park and led the public in giving him three cheers of "Hooray, Jacob Riis!" Other parks also were created, and Riis was popularly credited with them as well. Riis wrote his autobiography, The Making of an American, in 1901. His daughter, Clara C. Riis, married Dr. William Clarence Fiske. His son, John Riis (1882–1946), served in Gifford Pinchot's new United States Forest Service from 1907 to 1913 as a ranger and forest supervisor on national forests in Utah, California and Oregon. He chronicled his time in the Forest Service in his 1937 book, Ranger Trails. Another son, Edward V. Riis, was appointed US Director of Public Information in Copenhagen toward the end of World War I; he is known to have spoken publicly against antisemitism. A third son, Roger Williams Riis (1894–1953), was also a reporter and activist. In 1905, Jacob Riis's wife Elisabeth became ill and died. Riis remarried in 1907, and with his new wife, Mary Phillips, relocated to a farm in Barre, Massachusetts. Riis died at the farm on May 26, 1914. His second wife lived until 1967, continuing work on the farm, working on Wall Street and teaching classes at Columbia University. Riis's grave is marked by an unmarked granite boulder in Riverside Cemetery, in Barre, Massachusetts. Riis's concern for the poor and destitute often caused people to assume he disliked the rich. However, Riis showed no sign of discomfort among the affluent, often asking them for their support. Although seldom involved with party politics, Riis was sufficiently disgusted by the corruption of Tammany Hall to change from being an endorser of the Democratic Party to endorse the Republican Party. The period just before the Spanish–American War was difficult for Riis. He was approached by liberals who suspected that protests of alleged Spanish mistreatment of the Cubans was merely a ruse intended to provide a pretext for US expansionism; perhaps to avoid offending his friend Roosevelt, Riis refused the offer of good payment to investigate this and made nationalist statements. Riis emphatically supported the spread of wealth to lower classes through improved social programs and philanthropy, but his personal opinion of the natural causes for poor immigrants' situations tended to display the trappings of a racist ideology. Several chapters of How the Other Half Lives for example, open with Riis' observations of the economic and social situations of different ethnic and racial groups via indictments of their perceived natural flaws; often prejudices that may well have been informed by scientific racism. Riis's sincerity for social reform has seldom been questioned, but critics have questioned his right to interfere with the lives and choices of others. His audience comprised middle-class reformers, and critics say that he had no love for the traditional lifestyles of the people he portrayed. Stange (1989) argues that Riis "recoiled from workers and working-class culture" and appealed primarily to the anxieties and fears of his middle-class audience. Swienty (2008) says, "Riis was quite impatient with most of his fellow immigrants; he was quick to judge and condemn those who failed to assimilate, and he did not refrain from expressing his contempt." Gurock (1981) says Riis was insensitive to the needs and fears of East European Jewish immigrants who flooded into New York at this time. Economist Thomas Sowell (2001) argues that immigrants during Riis's time were typically willing to live in cramped, unpleasant circumstances as a deliberate short-term strategy that allowed them to save more than half their earnings to help family members come to America, with every intention of relocating to more comfortable lodgings eventually. Many tenement renters physically resisted the well-intentioned relocation efforts of reformers like Riis, states Sowell, because other lodgings were too costly to allow for the high rate of savings possible in the tenements. Moreover, according to Sowell, Riis's own personal experiences were the rule rather than the exception during his era: like most immigrants and low-income persons, he lived in the tenements only temporarily before gradually earning more income and relocating to different lodgings. Riis's depictions of various ethnic groups can be harsh. In Riis's books, according to some historians, "The Jews are nervous and inquisitive, the Orientals are sinister, the Italians are unsanitary." Riis was also criticized for his depiction of African Americans. He was said to portray them as falsely happy with their lives in the "slums" of New York City. This criticism didn't come until much later after Riis had died. His writing was overlooked because his photography was so revolutionary in his early books. From 1915 until 2002, Jacob Riis Public School on South Throop Street in Chicago was a high school operated by the Chicago School Board. Jacob Riis Settlement House, a multi-service community-based organization, is in the Queensbridge Houses, in Long Island City, Queens, NY. Riis Park on Chicago's Northwest Side in the Galewood-Montclare neighborhood. How the Other Half Lives: Studies among the Tenements of New York. New York: Charles Scribner's Sons. 1890. The Children of the Poor. New York: Charles Scribner's Sons. 1892. Nibsy's Christmas. New York: Charles Scribner's Sons. 1893. Out of Mulberry Street: Stories of Tenement Life in New York City. New York: Century. 1896. A Ten Years' War: An Account of the Battle with the Slum in New York. New York: Houghton Mifflin. 1900. The Making of an American. New York: Macmillan. 1901. The Battle with the Slum. New York: Houghton, Mifflin. 1901. Children of the Tenements. New York: Houghton, Mifflin. 1903. The Peril and the Preservation of the Home: Being the William L. Bull Lectures for the Year 1903. Philadelphia: George W. Jacobs. 1903. Theodore Roosevelt, the Citizen. New York: Outlook. 1904. The Old Town. New York: Macmillan. 1909. Hero Tales of the Far North. New York: Macmillan. 1910. Neighbors: Life Stories of the Other Half. New York: Macmillan. 1914. "How We Found Our Farm". The World's Work: A History of Our Time. 23: 475–479. February 1912. ^ a b c d James Davidson and Mark Lytle, "The Mirror with a Memory", After the Fact: The Art of Historical Detection 4th ed. (New York: McGraw Hill, 2000; ISBN 0-07-229426-4). ^ a b Alland, p. 19; Ware, pp. 19–21. Ware says he went not to the consulate but instead found a reception for "a Frenchmen's Society", where he exhausted his hosts' patience and from which he was expelled. ^ "Vice Which Is Unchecked", New York Tribune (date unidentified, but the second half of this is reprinted in Alland, pp. 32–33); as an anecdote told to Theodore Roosevelt, see Alland, p. 32. ^ S. F. Spira, The History of Photography as Seen through the Spira Collection (New York: Aperture, 2001; ISBN 0-89381-953-0), p. 77. ^ Alland, pp. 26–27; this reproduces the New York Sun article, "Flashes from the slums: Pictures taken in dark places by the lighting process: Some of the results of a journey through the city with an instantaneous camera—The poor, the idle and the vicious." ^ Chris Howes, "Flash Photography", Oxford Companion to the Photograph, ed. Robin Lenman (Oxford: Oxford University Press, 2005; ISBN 0-19-866271-8), pp. 224–25. ^ Burrows, Edwin (1999). Gotham : a history of New York City to 1898. New York: Oxford University Press. p. 1183. ISBN 0195140494. ^ Martin Parr and Gerry Badger, The Photobook: A History vol. 1 (London: Phaidon, 2004; ISBN 978-0-7148-4285-1), 53. ^ Alland, pp. 30–31 (although Alland misattributes In Darkest England to Charles Booth). ^ Campbell, Helen. Darkness and Daylight. archive.org. p. xii. ^ "Jacob A. Riis". New York Times. December 19, 1903. ^ "Mr. Riis's Autobiography". New York Times. December 7, 1901. ^ "Jacob A. Riis, The Story of His Americanization". New York Tribune. January 31, 1902. ^ Theodore Roosevelt, Theodore Roosevelt: An Autobiography (BiblioBazaar, 2007; ISBN 1-4346-0319-9), p.66 (Here at Google Books); an earlier edition also at Project Gutenberg. ^ Theodore Roosevelt, "Reform through Social Work: Some Forces that Tell for Decency in New York City", McClure's Magazine, March 1901. Reprinted in Judith Mitchell Buddenbaum and Debra L. Mason, eds., Readings on Religion as News (Ames: Iowa State University Press, 1999; ISBN 0-8138-2926-7), p. 187. Available online at Google Books (which inexplicably claims publication by Wiley-Blackwell). ^ "A day's weddings" (PDF), New York Times June 2, 1900. Accessed 2009-08-17. ^ "Danes welcome Riis: Glad he has come to represent our information bureau" (PDF), New York Times September 21, 1918; "O'Malley puts punch in synagogue drive", Brooklyn Daily Eagle, December 9, 1919 (page scan, PDF). Both accessed 2009-08-17. ^ "Jacob A. Riis Papers: A Finding Aid to the Collection in the Library of Congress" (PDF). Library of Congress. 2007. Retrieved 5 September 2017. ^ "Roger William Riis Papers: A Finding Aid to the Collection in the Library of Congress" (PDF). Library of Congress. 2007. Retrieved 5 September 2017. ^ "Roger William Riis and the "Battle of the Slums"". WNYC. January 8, 1950. Retrieved 5 September 2017. ^ Francesca Pitaro, "Guide to the Jacob Riis Papers" (Manuscripts and Archives Division, New York Public Library, 1985; available as a PDF file here Archived 2006-10-15 at the Wayback Machine). ^ Thomas Sowell, The Quest for Cosmic Justice (Simon and Schuster, 2001), ISBN 0-7432-1507-9, pp. 128–129. ^ "Jacob Riis Triangle", New York City Department of Parks and Recreation, 2001. Accessed 13 August 2009. ^ "Jacob Riis Playground", New York City Department of Parks and Recreation, n.d. Accessed 13 August 2009. ^ "P.S. 126 The Jacob Riis Community School Archived 2009-01-08 at the Wayback Machine". Insideschools.org. Accessed 11 August 2009. ^ "Jacob Riis Public School Archived 2009-02-07 at the Wayback Machine", Preservation Chicago. Accessed 11 August 2009. ^ "The History of Settlement Houses Archived 2009-09-24 at the Wayback Machine" at www.riissettlement.org. Accessed 11 August 2009. Riis, Jacob (2018) . The Children of the Poor: A Child Welfare Classic. Pittsburgh: TCB Classics. ISBN 9780999660409. Romero Escrivá, Rebeca. "Literatura y fotografía: las dos mitades de Jacob Riis". In Archivos de la Filmoteca. Revista de estudios históricos sobre la imagen, n. 67, April 2011, pp. 170–193. ISSN 0214-6606. Available online here. Romero Escrivá, Rebeca. "Riis, Capa, Rosenthal. Traducciones cinematográficas de la fotografía". In L'Atalante. Revista de estudios cinematográficos, n. 8, July 2009, pp. 124–133. ISSN 1885-3730. Available online here. Ware, Louise. Jacob A. Riis: Police Reporter, Reformer, Useful Citizen. New York: Appleton-Century, 1938. Also available online at archive.org. Wikimedia Commons has media related to Jacob Riis. "Jacob A. Riis's New York". New York Times. February 27, 2008. Retrieved 2008-08-08. Davis, Kay. "Documenting 'the Other Half': The Social Reform Photography of Jacob Riis and Lewis Hine"
Flash Forward: How the flashbulb changed the face of urban poverty, article on Riis.